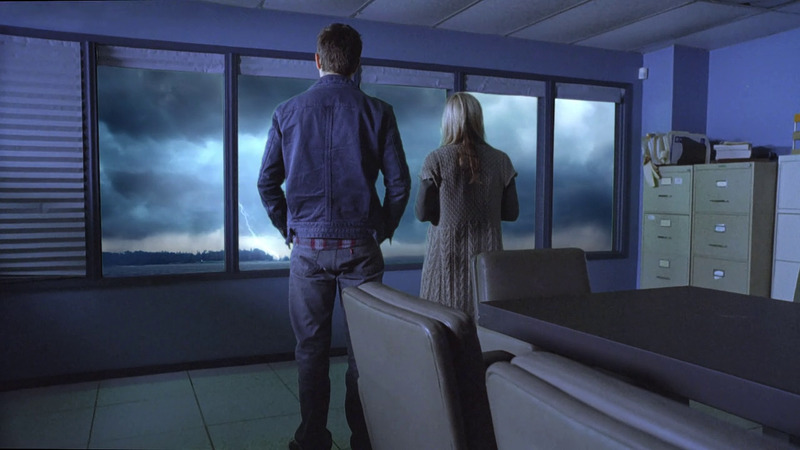 If you’re a fan of crappy made-for-TV horror/thriller movies than you probably saw Sharknado. It was an event like no other and even warranted an encore presentation, and not just to fill a time slot but because people actually wanted to see it. I missed it the first time, saw it the second, and was torn between being glad I did and being very, very sad I did. It was literally the worst movie I’ve ever seen, while somehow being incredibly captivating. It was like a horrible parade of images that you can’t turn away from, even though you know you should. 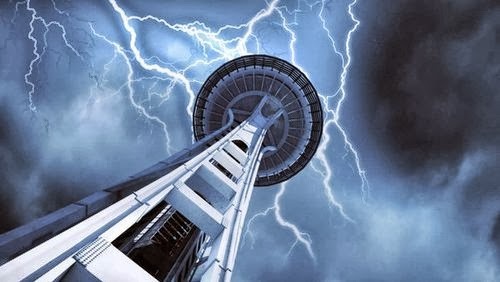 Now, Seattle Superstorm is somewhere on the same level as Sharknado, but it both rose above it and sank below it at the same time. Hard to explain and hard to categorize, but true; this was a much better film but had absolutely nothing in its favor. The movie began somewhat believably. As a modern day family, the main characters were easy to relate to. Tom, a single dad, is engaged to Emma, a single mother. Their families are coming together in Seattle to start their new life. The problem is that their children, Wyatt & Chloe, don’t get along. She’s a hippie conservationist while he’s a fuel-burning gear head. They fight, they argue, and they’re driving a wedge between their parents. It looks like the engagement might be off, when a horrific event brings them together. While at the local market, an object falls from the sky and crashes through the roof, terrifying the family and bringing up fears of terrorist attacks. Emma, a senior member of the armed forces, must rush off to gather intelligence, and Tom, a biologist, attempts to figure out what exactly happened. Wyatt & Chloe are on their own and must work together to get home safe. But nowhere in Seattle is exactly safe right now. The object that crashed through the roof of the market was half of an unidentified projectile hurtling through the air near the city. The government, seeing it as a threat, shot it down with a missile, splitting it into two parts: one hit the market and the other landed in the bay. The piece in the water is now expelling a strange smoke, one that might have lethal properties and also seems to be affecting the weather over Seattle. 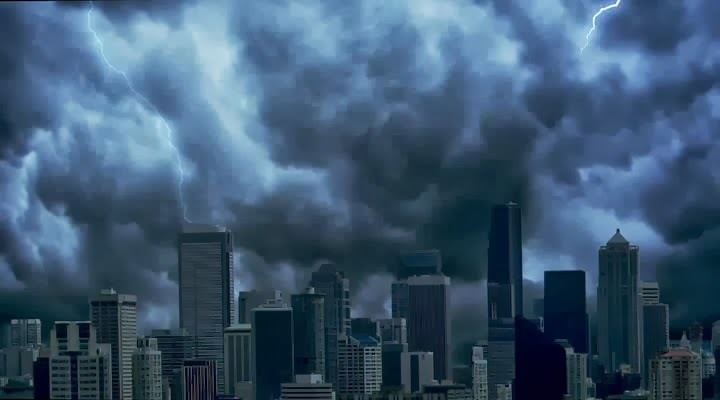 A giant storm begins to brew with no sign of calming down before it destroys the city, or perhaps the world. Emma attempts to gather data and save the lives the people. Tom tries to figure out the biological origin of the object and stop the deadly storm. And Wyatt & Chloe battle for survival out in the elements. When they all team up, with a little help from a retired Russian scientist, they begin to understand the catastrophic capabilities of the storm and what they must do to stop it. It might not make sense, but Seattle Superstorm really is better and worse than Sharknado. It wasn’t as goofy or unbelievable. They seemed to really be trying to infuse some science into the plot, make it somewhat realistic or at least acceptable. There were some wild conspiracy theories thrown out there in the film, but ultimately it became man vs wild, a battle between nature and man’s excellent brain. So they at least tried. But without the insanity & blood & Tara Reid, it just became another boring sci-fi movie, not an event of any kind, let alone something you’ll remember five minutes after you watch it. That was the best thing that could be said about Sharknado; it might be the worse thing ever, but there’s no forgetting it and there’s no outdoing it. So while this movie was much less ridiculous, it was also much less entertaining and memorable. If the plot rose slightly above the standard drivel, the acting sure didn’t. 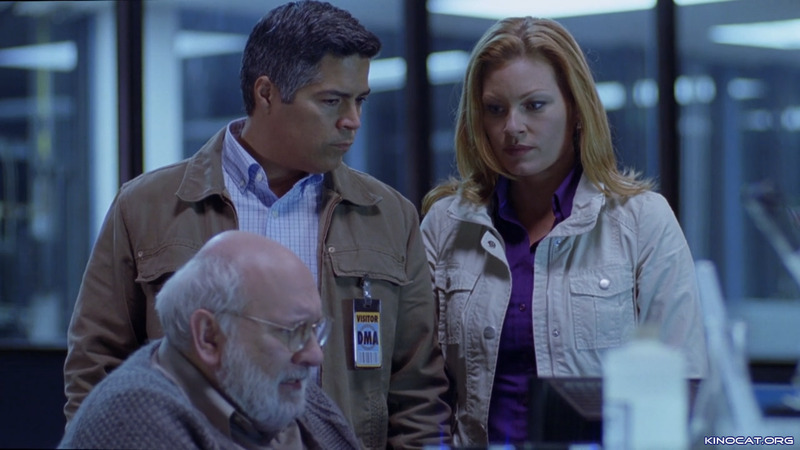 I’ve seen and enjoyed Esai Morales in a couple projects (NYPD Blue, Gun Hill Road), but wow was he bad in this one. It was as if he wasn’t even trying. I’m not sure exactly how much time he spent preparing for this role, but it couldn’t have been much more than fifteen minutes. Ona Grauer was equally bad as his fiancee. First, there was exactly zero chemistry between the two. And second, she was as believable as a tree stump. I assume she was cast because she is pretty, but she didn’t do anything for me. And if the parents were bad, the kids were terrible. MacKenzie Porter & Jared Abrahamson were like children in a beginners acting class; over-the-top, loud, and comically untalented. None of the side characters brought anything, so they’re not even worth mentioning, and the whole film suffered from a general lack of talent. I’m trying to think of a few good things to say and it’s difficult. Even the storm itself wasn’t cool. It seems like the worse thing the characters had to deal with was a windy day. That and the eminent demise of the Space Needle. I honestly didn’t want it to fall. It was as if the movie didn’t deserve something as spectacular as a monument crashing down; it wasn’t earned. So the storm wasn’t fun, the plot was odd, the acting was horrid. The best that can be said for the movie was that it was quick. It delivered a slightly acceptable story, gave it to us fast, steered clear of ridiculous twists, and ended with a whimper. I wasn’t angry after having watched it, but I wasn’t satisfied either. I wanted it to go to one extreme or the other, to be something worth mentioning, good or bad. But it ended up as just another throw-away TV movie, nothing more nothing less. Video – The picture quality of the film was fine. There were no glaring problems or editing flaws. The storm actually looked cool, with a ton of lighting and dark clouds. Not anything to get excited about, but with little else to point to the visual of the storm might have been the highlight of the movie. Audio – The film was done in Dolby Digital. You have an option for listening to the movie in either English 5.1 or English 2.0. There are no options for the hearing impaired, nor are there any subtitle options for viewing the film in other languages. Extras – The only extra on the DVD is a trailer for the film. Skip It. Just a bad idea all around. It was a crappy movie without redeeming qualities that would have at least made it fun to watch. I can’t say it was worse than others of its kind because at least they tried to make a legitimate film, but they failed to make it the least bit interesting to entertaining. The video was fine, the audio was fine, and the extras were almost nonexistent. You could do much worse than Seattle Superstorm, but you probably should.